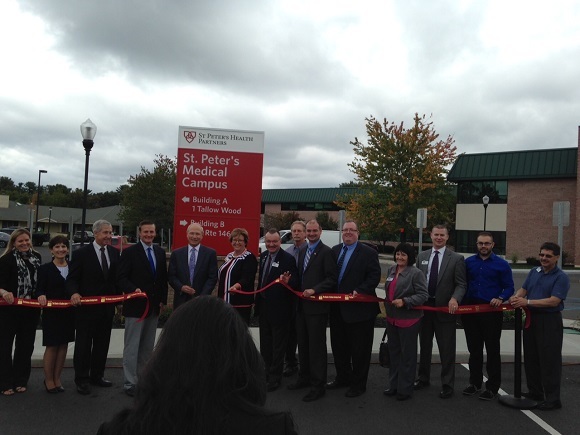 A ribbon cutting was held on Oct 4, 2016 to celebrate the grand opening of the new St. Peter’s Medical Campus at 855 Route 146, Clifton Park. In addition, an announcement to skip the wait, by going to www.sphpma.com to reserve your spot for St. Peter’s Urgent Care. Urgent Care is located at 1 Tallow Wood Dr. Clifton Park. Pictured center: Clifton Park Town Supervisor, Phil Barrett, Dr. James Reed, President and CEO, St. Peter’s Health Partners, Pam Williams, CEO, St. Peter’s Health Partners, Medical Associates, Pete Bardunias, President/CEO of The Chamber of Southern Saratoga County, Tom Cronin, Success Magazine, Chamber Ambassador, Jonathan Schopf, County Supervisor, Halfmoon Town Supervisor, Kevin Tollisen, Joyce Maddalone, Mother Teresa Academy, Chamber Ambassador, Brian White, Saratoga National Bank, Chamber Ambassador, Josh Myers, Ballston Spa National Bank, Chamber Ambassador, Garry Packer, Viridian Energy, Chamber Ambassador.